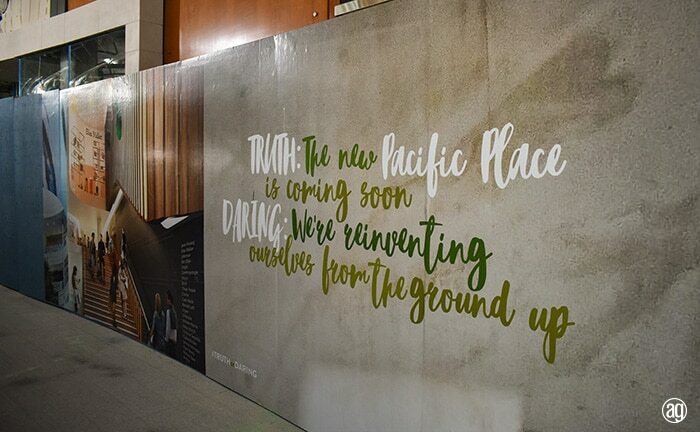 If you’ve been to Pacific Place Mall recently you probably noticed that it is in the middle of a massive remodel. 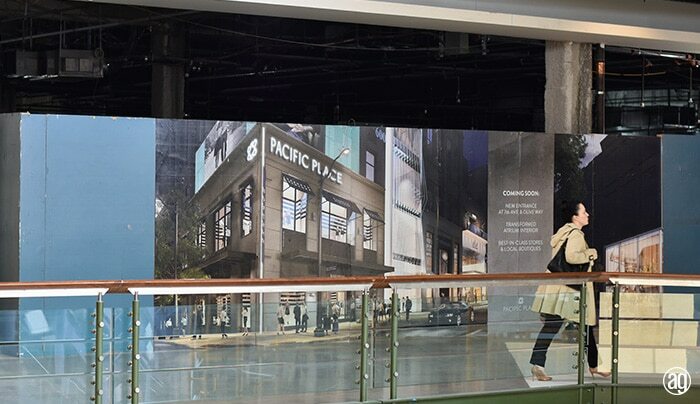 The 339,000 square foot, four story building located in the heart of downtown Seattle is home to more than 50 shops and restaurants. 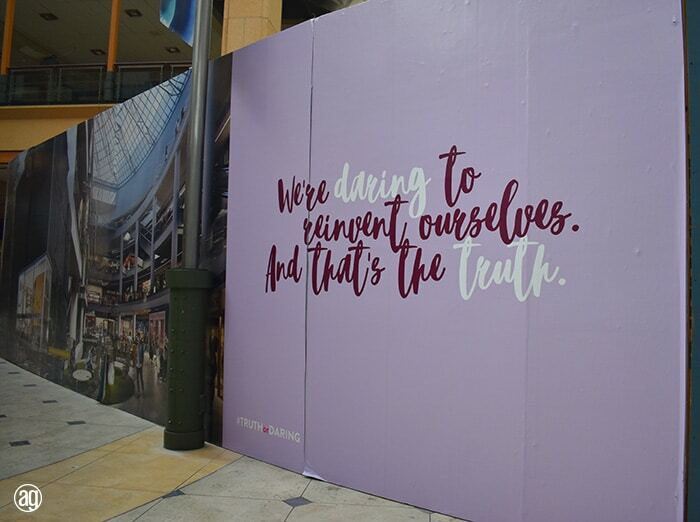 The real estate company, Madison Marquette, owns the mall. 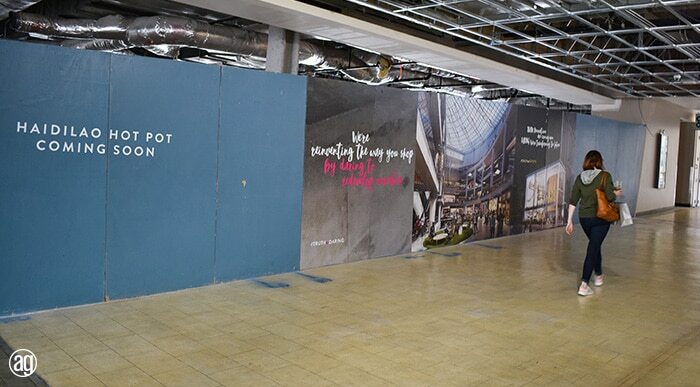 They are overseeing the multi-million dollar renovation. 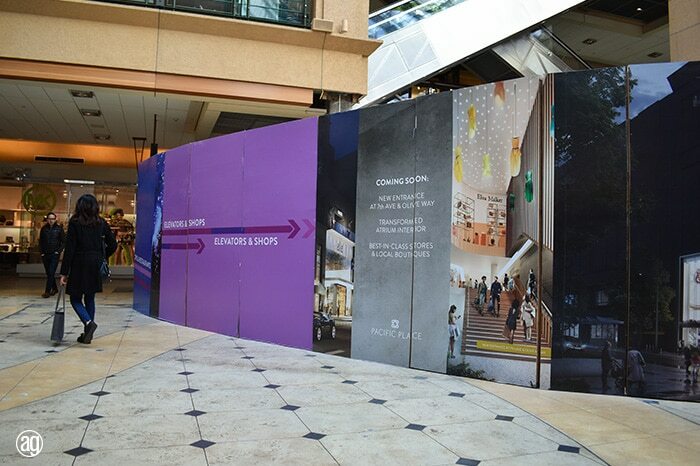 The mall remains open during construction, and where there’s construction there are construction barricade walls. 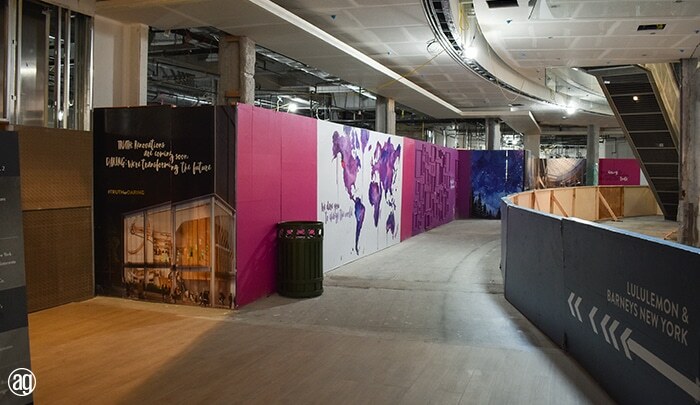 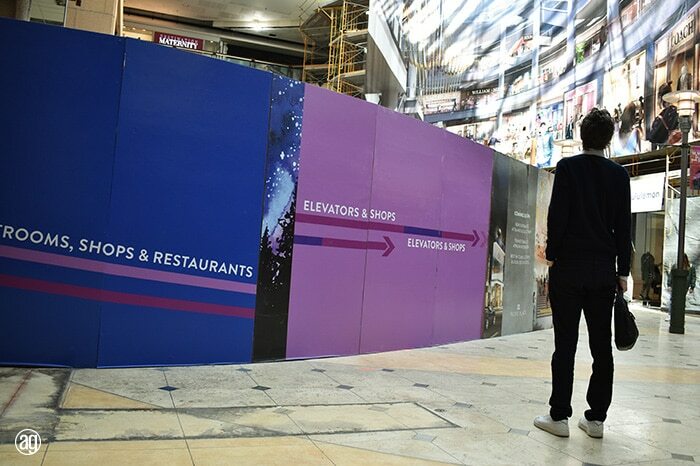 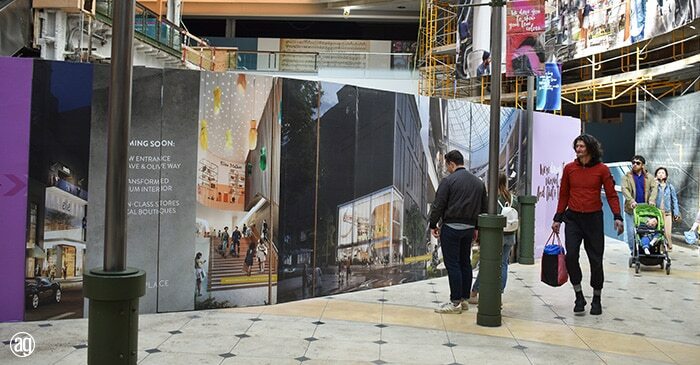 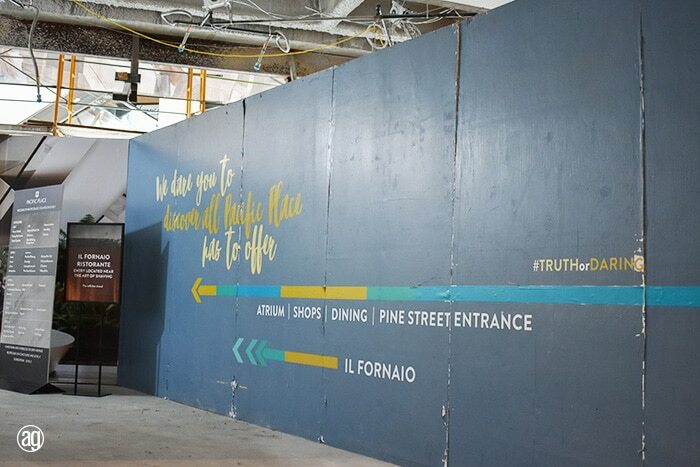 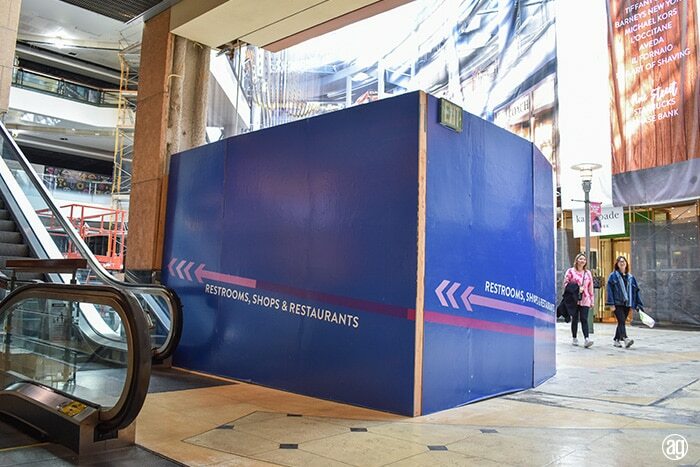 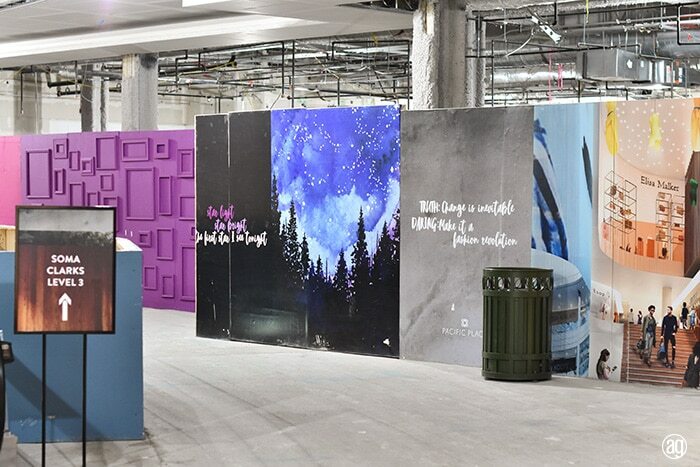 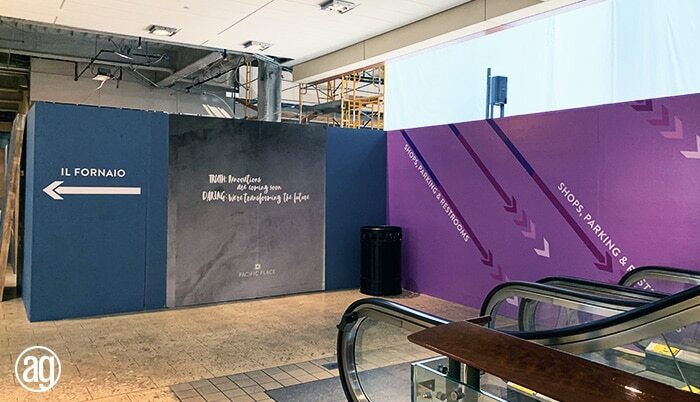 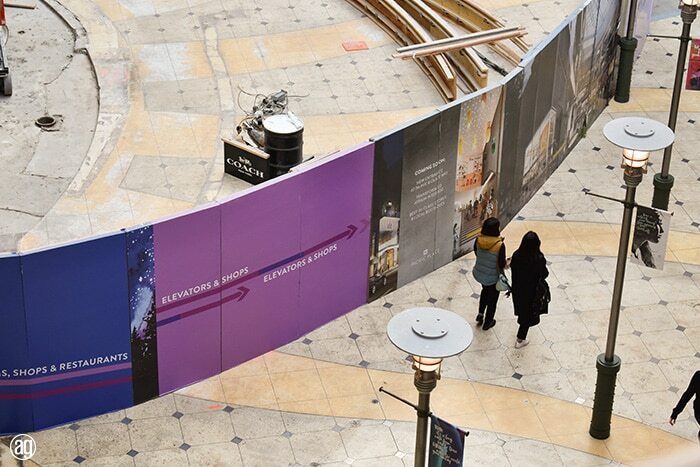 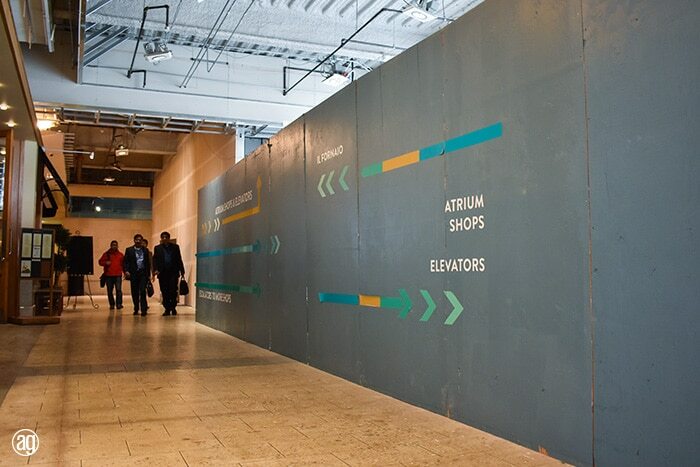 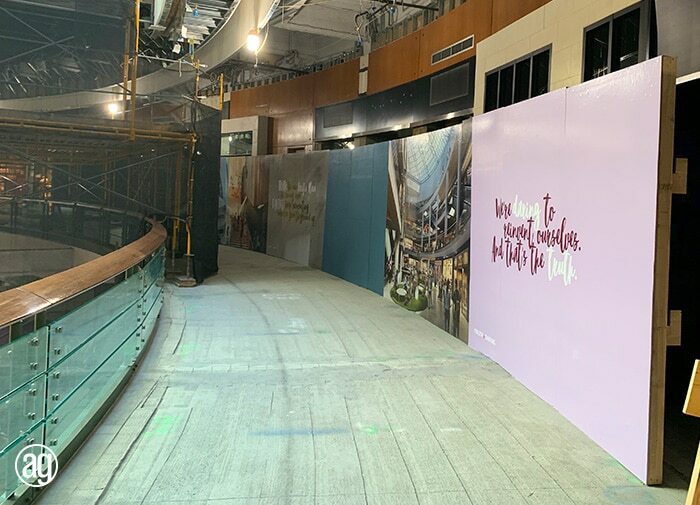 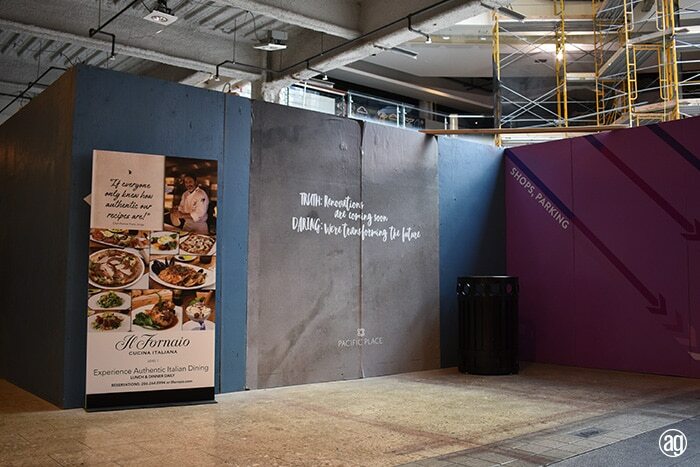 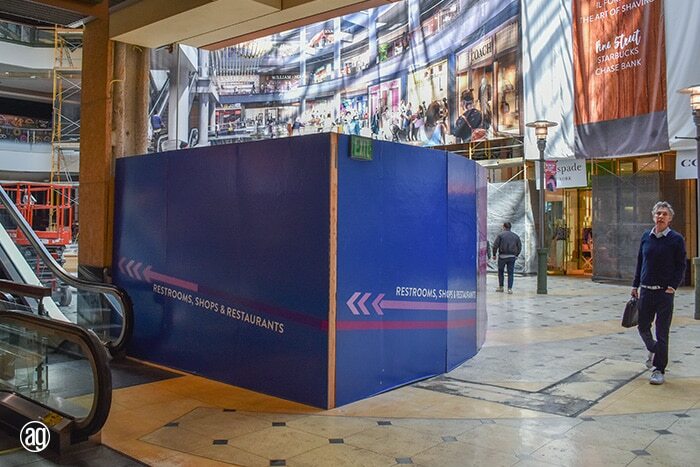 Thousands of feet of temporary construction barricade walls have been erected inside Pacifi Place Mall to safely keep shoppers out of designated construction areas. 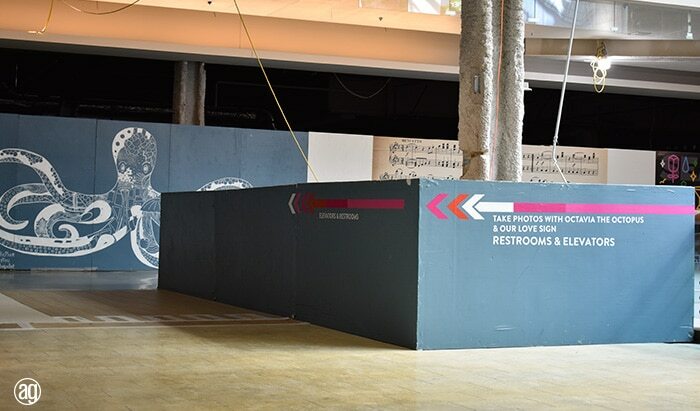 Instead of letting all that valuable construction wall surface area go to waste, Madison Marquette had better ideas. 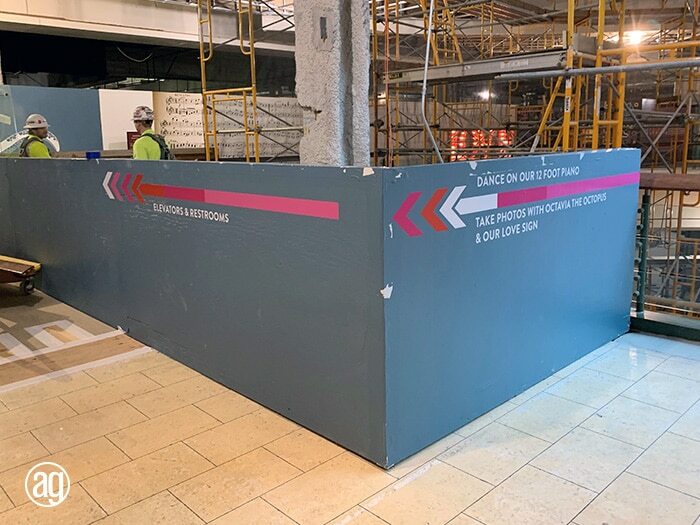 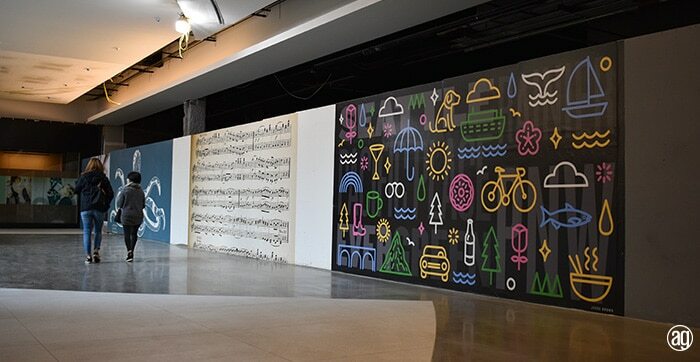 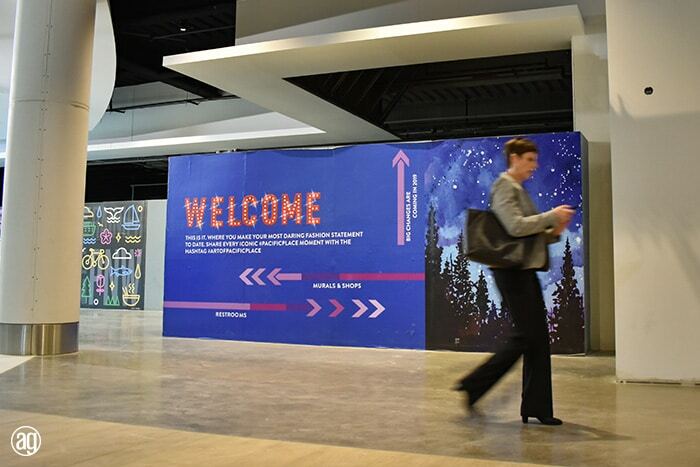 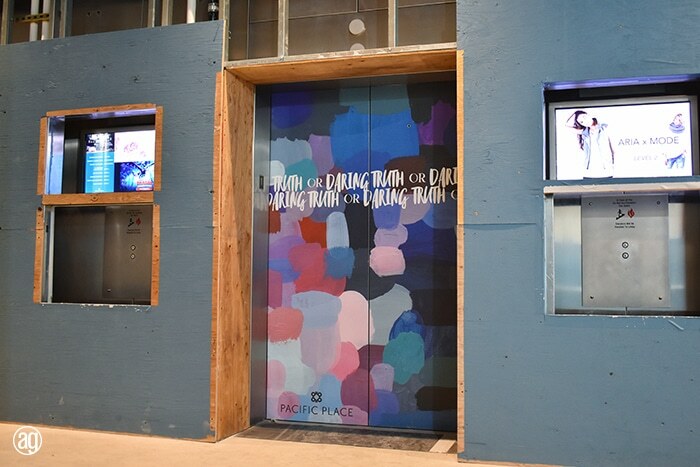 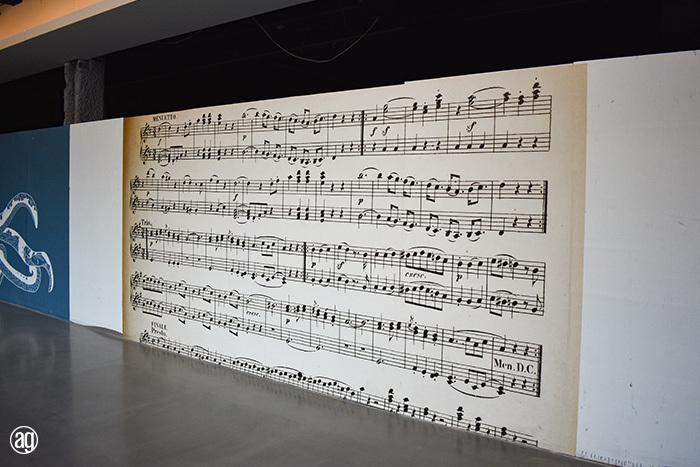 We partnered with them to print and install graphics that transformed their blank construction barricade walls into a massive marketing campaign. 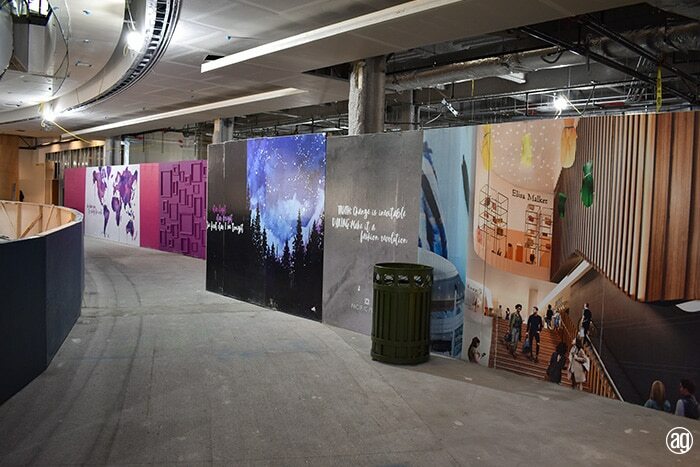 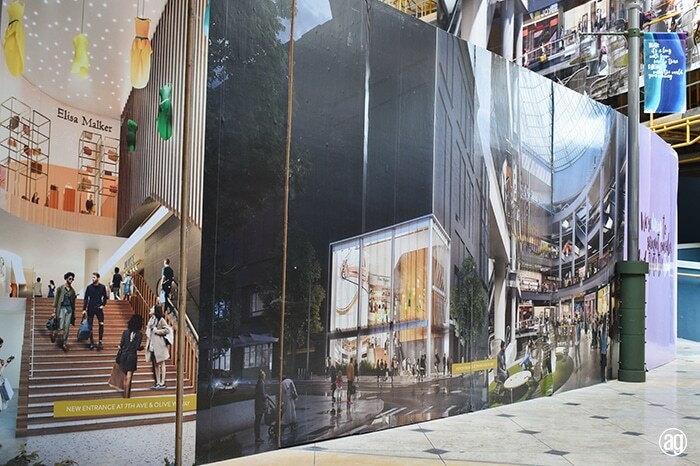 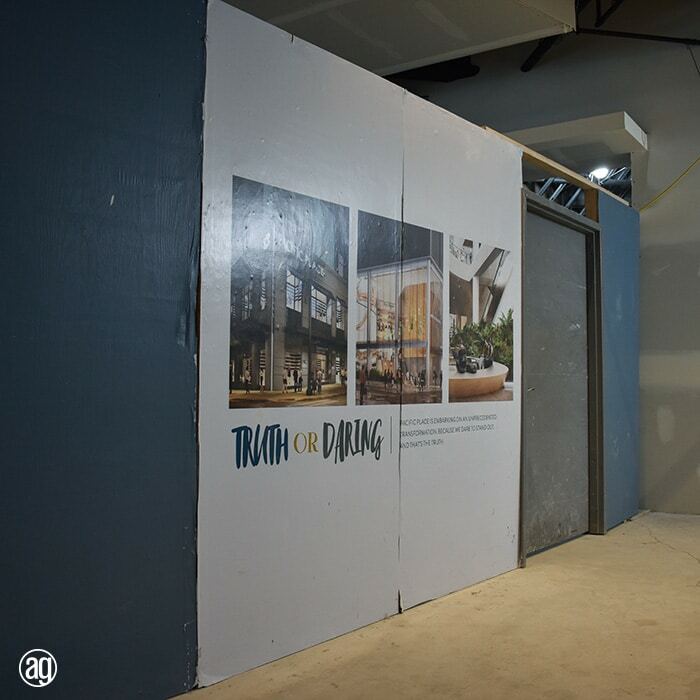 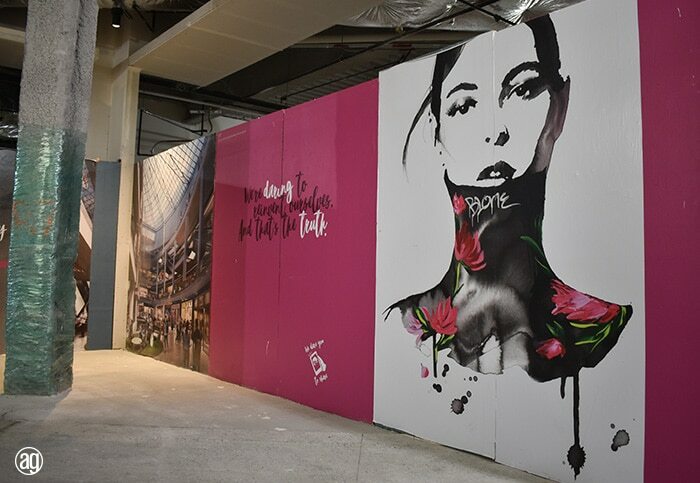 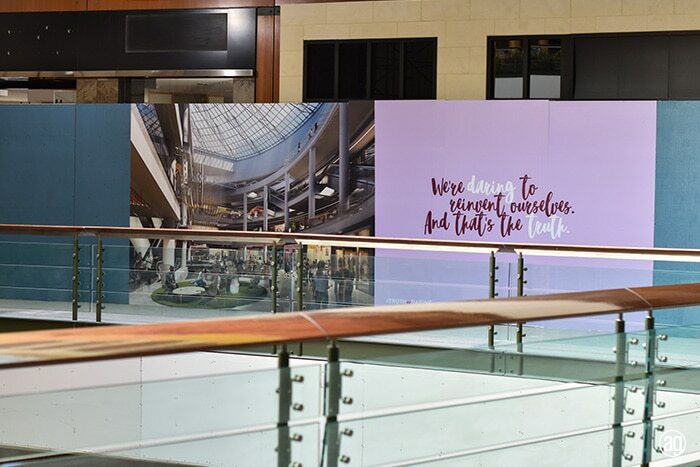 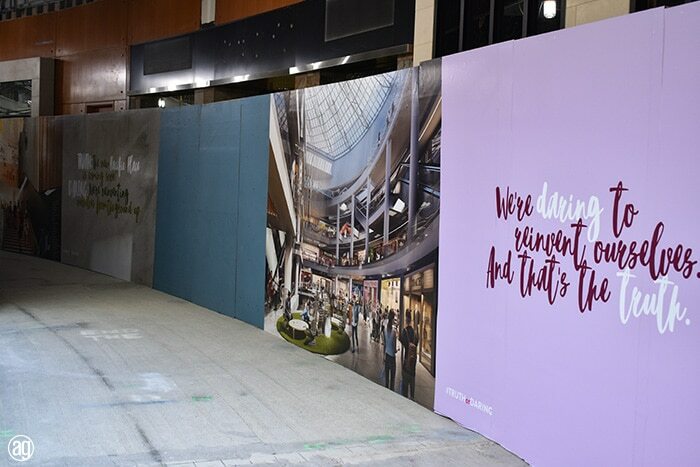 The graphics, designed by Madison Marquette, contain imagery and messaging about the remodel and what the mall will look like when complete. 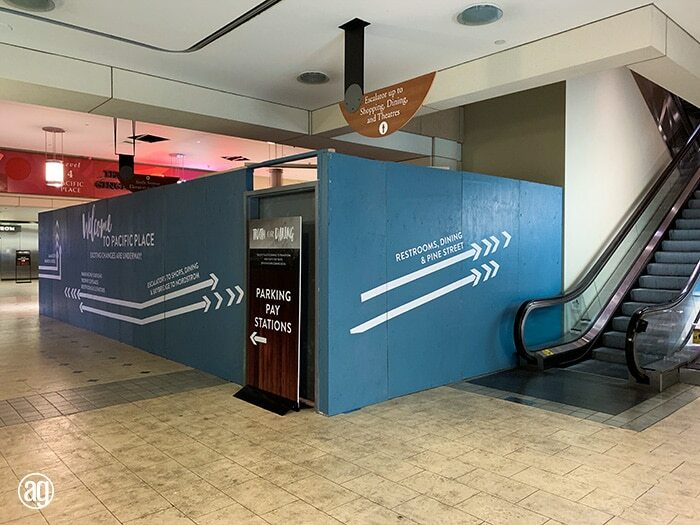 They communicate to customers that even though the mall is currently in a state of “disarray”, the remodel will be well worth any inconvenience once completed. 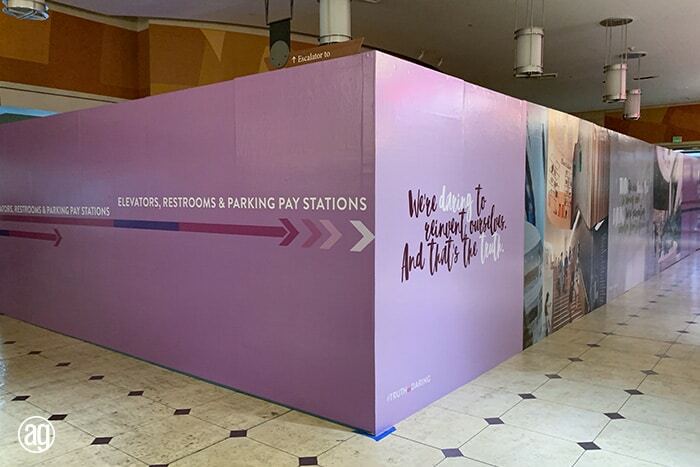 The excitement of things to come helps put customers at ease during the transition. 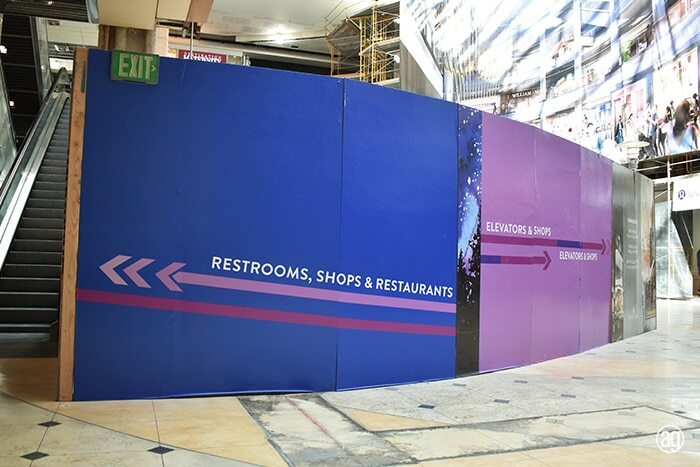 There is also a large amount of way finding signage installed on the construction barricade walls. 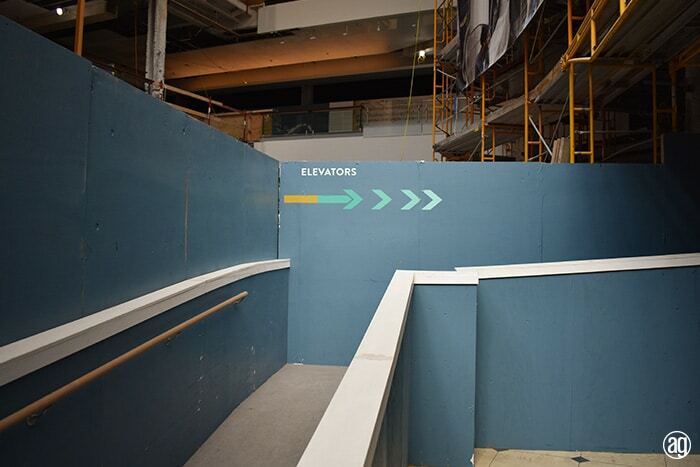 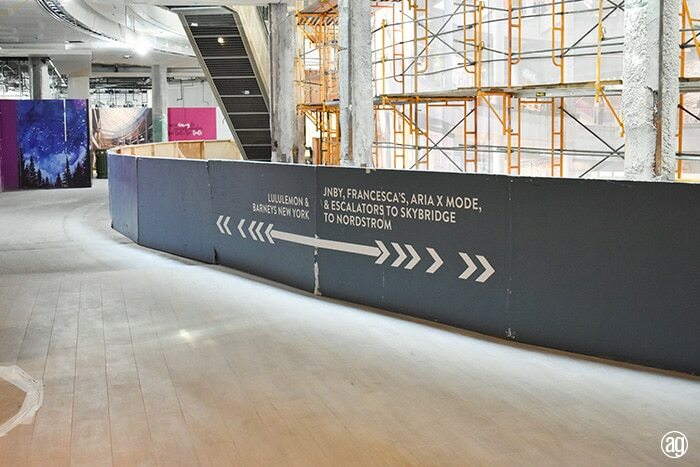 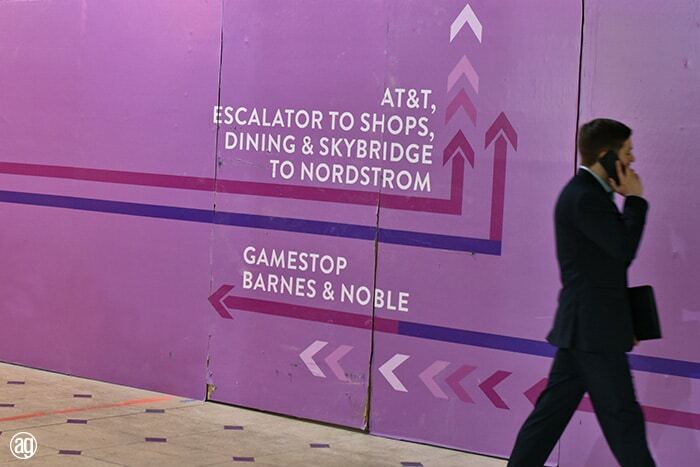 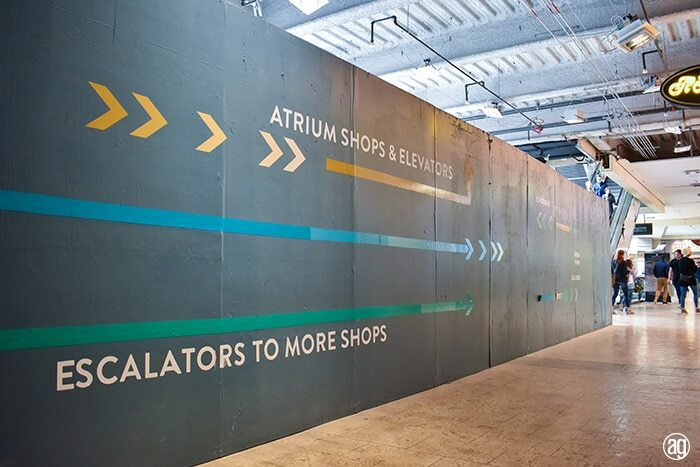 These signs help mall goers navigate the mall so they can get to where they need to go. 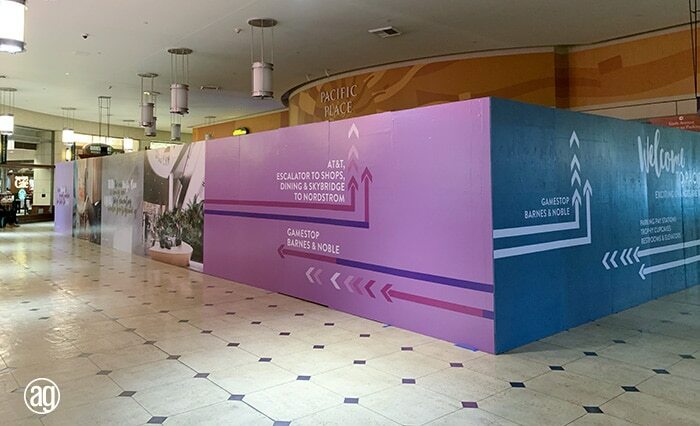 From the photos below you can see that we installed A LOT of graphics. 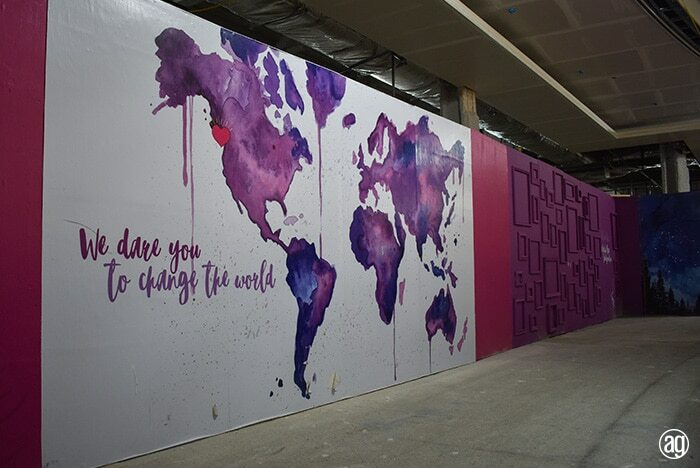 This is a work in progress and we are adding new graphics weekly. 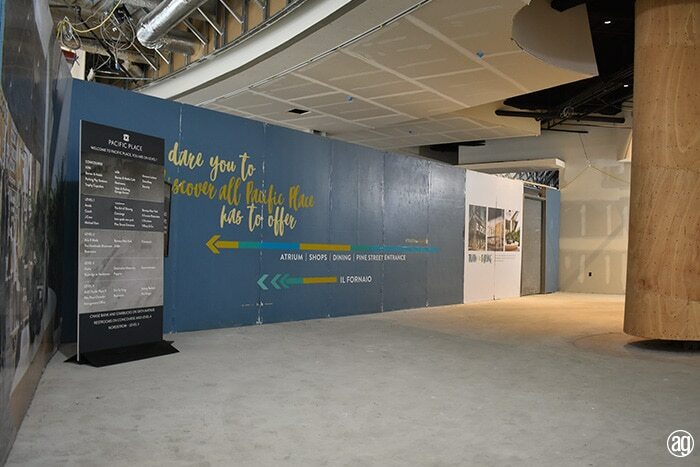 It is nice to have the opportunity to work on large-scale projects like this one that help shape the community. 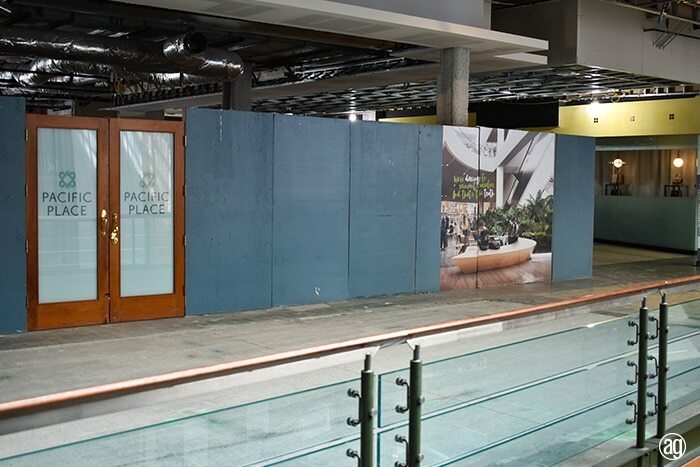 We can’t wait to see what Pacific Place Mall looks like once the renovation is complete. 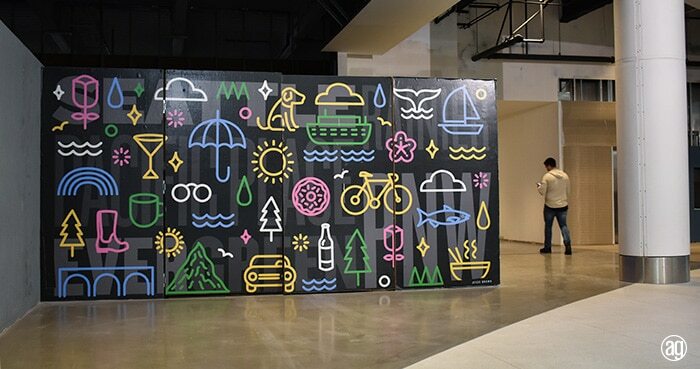 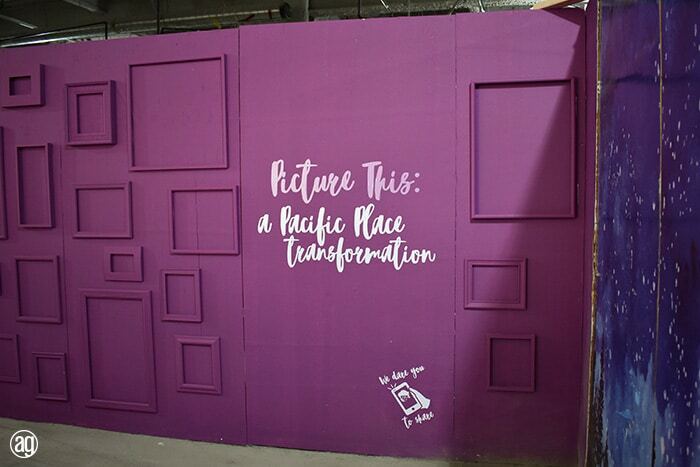 If you happen to find yourself at Pacific Place Mall any time soon, be sure to take a selfie in front of one of the graphics — tag us on Instagram at @alphagraphicsseattle.